My husband has been working hard on his renewed hobby: mopeds! I’ve lost track of how many he’s, I mean we’ve, bought over the years, all in various states of disrepair, but he found a decent one for me recently that he’s restoring. Or rather I should say, he’s making it better than it ever was. That’s his true hobby, making things better than the way they were. So my pic below doesn’t exactly capture reality but you’ll get the essence. I used the stock paint program on my Windows computer to get an idea of colors, although I won’t be doing yellow rims. I’ll post more pics when the powder coating actually happens, but that will probably be in a month or so is my guess, in time for summer! Now I just have to find some accessories for me, like a helmet and jacket. I did pick out one helmet with polka dots but it turned out I looked like a toadstool from Mario Bros. Back to the accessory board. 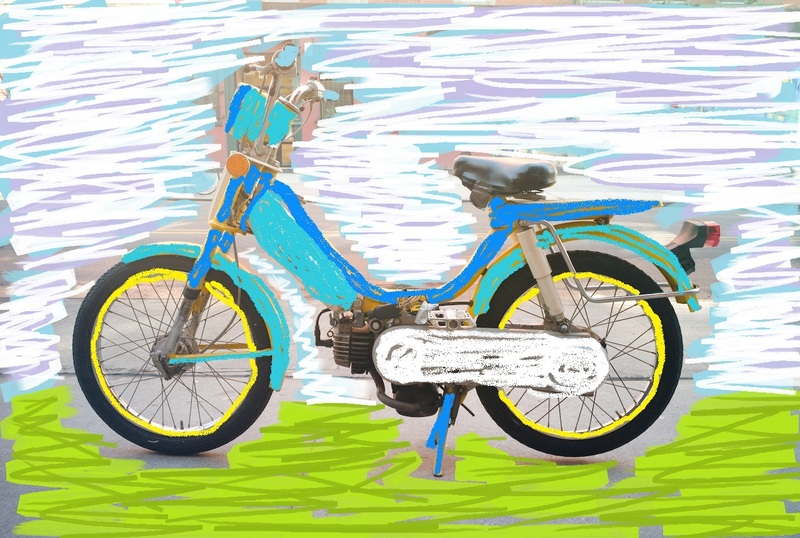 This entry was posted in land&language, sparkles and tagged awesome husband, moped, summer on 1 May 2012 by cheryl.